QAA, Lebanon (CNS) — When a series of bombs exploded in a Lebanese Christian village near the Syrian border in June, it not only changed the lives of the victims and their families, but also the lives of Syrian refugees living nearby. In a government effort to prevent any future attacks, a Lebanese town that was once a lifeline for Syrians for education, activities and friendships has now been cut off from the local Syrian community. “Before the bombings, we had nearly 350 Syrian children coming to our center every day for classes and activities,” said Father Elian Nasrallah, a priest at St. Elias Melkite Catholic Church, located just footsteps from the attacks three months ago. Before that, the community center hosted both Syrian and Lebanese children, who learned and played together and celebrated one another’s holidays. The priest said they will reopen the center later in October, even under high security and tensions. Although tourism is slowly returning to the area, with Lebanese from different parts of the country visiting for hunting trips and barbecues, tensions remain between the Lebanese government tasked with protecting its citizens and an increasingly frustrated Syrian refugee community that feels stifled by suspicion restrictions. “We’re not in a normal situation. What happened was very hard. 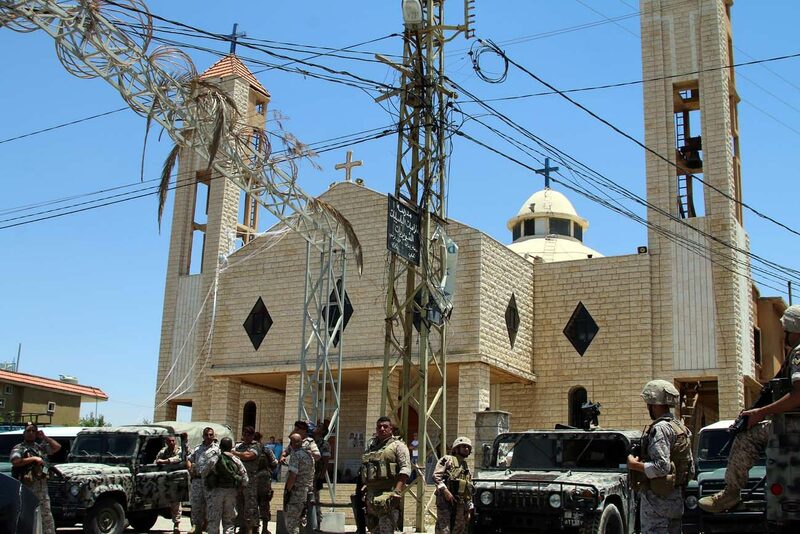 We need to think about the martyrs and their families,” the priest said. Four suicide bombers hit the town square of Qaa in two separate incidents June 27, killing themselves and five residents and wounding more than 30 others. It shook up the relatively quiet frontier area, highlighting its vulnerability as bordering a part of Syria controlled by the Islamic State group. Since then, the area’s growing Syrian refugee community of around 30,000 has been under tight security. Hundreds have been arrested on suspicion of having connections to the attacks, and the residents of the agricultural area called Qaa Projects, which has become a vast informal tented settlement, now require government permission to leave the area. On a recent Sunday, Fawza Ibrahim Ali was in Qaa, having gotten permission through Father Nasrallah to visit. She needed medicine and respite from her life at the makeshift camp, where families of 10 share tents, and where the past three months have meant isolation and uncertainty. With no end in sight, she dreams of returning to Raqqa, the Syrian capital of Islamic State’s self-proclaimed caliphate. Ali remembers better days there: neighbors visiting one another, children playing outdoors and going to school, and women wearing colorful clothing — unlike the full black niqab they’re now required to wear — and walking through the city at all hours. It’s where she met her husband, and where her oldest daughter, now 20, earned her bachelor’s degree at age 16. Ali hopes for a better situation between the Syrian refugees and the residents of Qaa, in which they would be able to once again visit one another freely. “They used to come to our tents for tea. Now, we don’t get any visitors.” She emphasized that she is grateful for the medical and emergency care that she and other refugees in Qaa Projects receive from the United Nations and the Lebanese Red Cross. But they’ll need more than the essentials to heal their isolation and stagnation. The first step to getting things back to relative normality will be reopening the community center for children, which offers classes and activities; for many, it is the closest thing they’ve had to a school since they arrived in Lebanon. Fortunately for the children, they don’t need government permission to move around. But they might need to feel welcome, after three months of tight security.